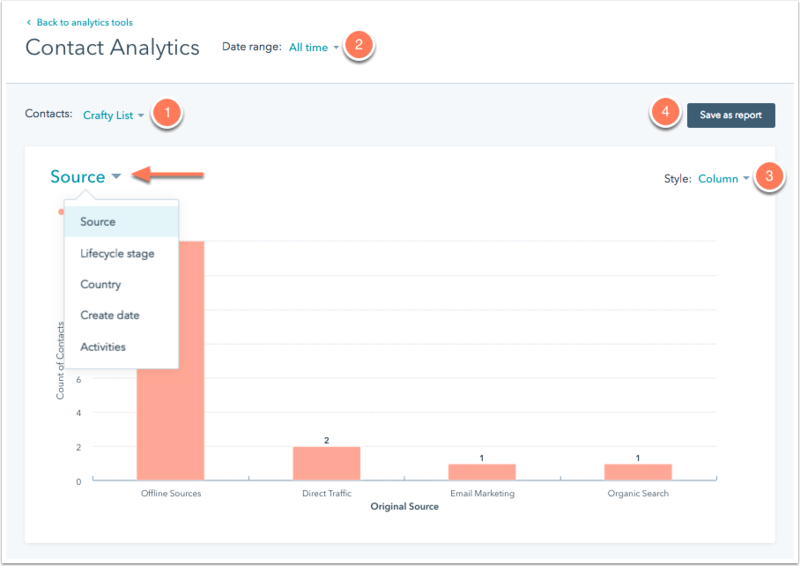 Use the contacts analytics tool to break down your contacts by source, lifecycle stage, country, create date, or activities. Analyze trends for a specific list, saved filter, or across your entire contact database. Click Contact Analytics. You'll see your contact data in a visual chart with a table view below. Source: analyze the original source of your contacts. In the table view below, you can drill down into a specific source to see more details for each contact in your report. Lifecycle stage: analyze how your contacts are distributed across lifecycle stages in the buyer's journey. Country: analyze your contacts by country. This report is based on the IP country property value from a form submission. Create date: analyze your contacts by create date. This report is based on the year the contacts were added to your contact database. Activities: analyze your contacts by activities. This includes the number of marketing email opens and clicks, tracked visits to your website, clicks on social links, and conversions on your HubSpot forms. Use the Contacts dropdown menu to filter your report for a specific list or saved filter. Use the Date range dropdown menu to analyze your contacts over a specific timeframe. Adjust the chart at the top of your report using the Style dropdown menu. The styles available depend on the type of data being plotted on the chart. Click Save as report to add this to a dashboard in your reports tool and share this data with your team. The table view at the bottom of your report updates to reflect the report filters you've selected. Click on a contact name to open their contact record in a new window. Click Use in list to create a new list with these contacts, or add them to an existing list. Click Export to email yourself or a member of your team a file with these specific contacts. Click Go to Contacts to jump to a new saved filter of these contacts created with all the same criteria of your contacts analytics report.